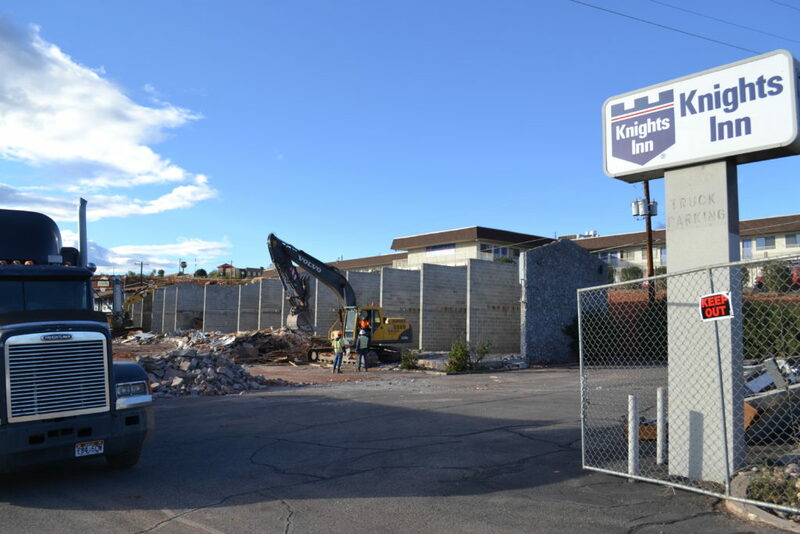 ST. GEORGE — One of the first motels in St. George, the Knights Inn located at 175 N. 1000 East, is undergoing demolition to make way for construction of a Comfort Suites in its place. Originally constructed in 1977, the motel spent nearly 40 years in business. The plat, valued at $1.26 million, was approved by the St. George Planning Commission to allow for a new four-story hotel. 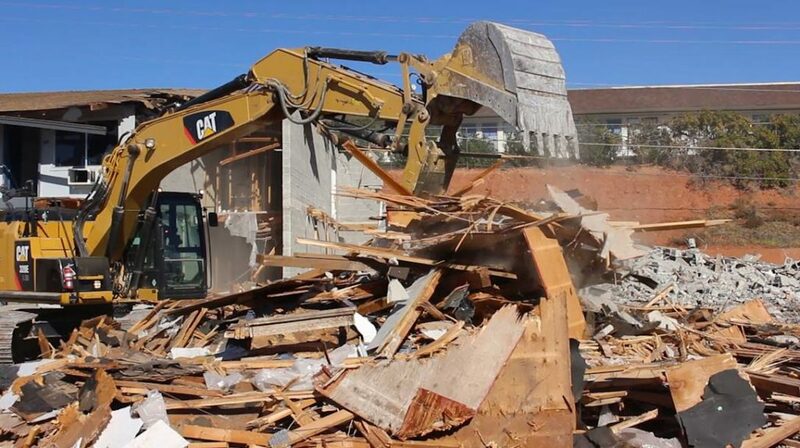 Watts Construction is overseeing the construction of the new Comfort Suites at the location shortly after demolition of the old motel is completed. Demolition should wrap up within about two weeks, Watts Construction Superintendent T.J. Ford said. 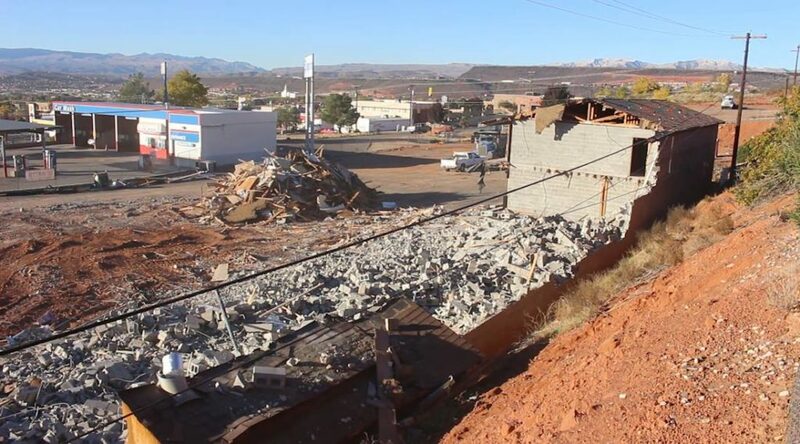 Demolition efforts by Red Rock Earthmovers were preceded by asbestos extraction from the building built in an era before EPA’s 1991 Asbestos Ban and Phase Out Rule, company owner Stephen Howard said. 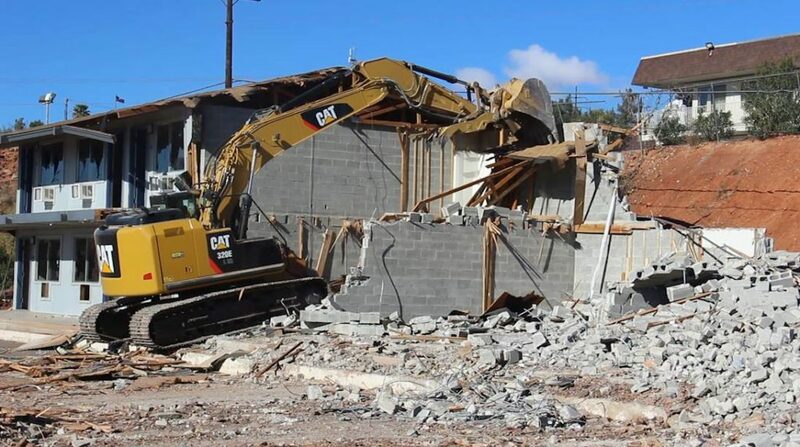 Howard skillfully operated an excavator to tear down the last section of the old building Tuesday, working carefully to pull the building forward to avoid adjacent power lines. By the end of the day, the entire structure had been leveled, leaving only a pile of destroyed building materials. The material was either hauled to the dump or prepared for recycling. Crews worked to separate viable concrete that would be sent to Sunroc Building Materials for recycling. Among the scrap, construction crews reportedly found drug paraphernalia. 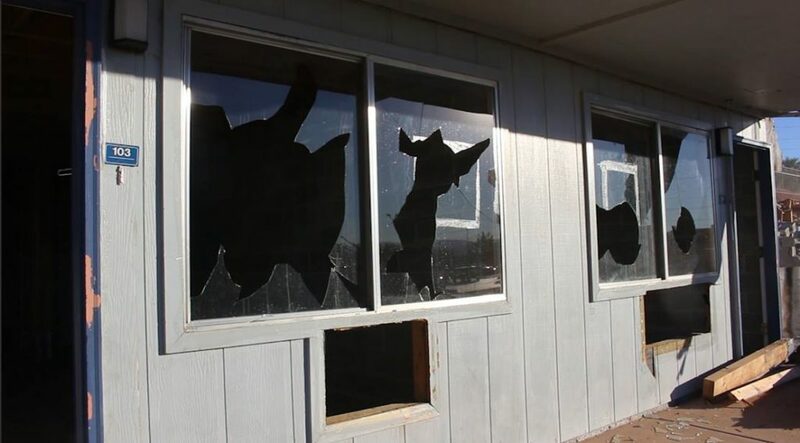 The motel was previously the subject of a police raid involving drug deals. Police were dispatched to the location 10 times since January of this year on occasional reports of criminal activity, St. George Police Capt. Mike Giles said. “I would just say as a city and as an agency, new establishments and new buildings are always a positive,” Giles said of the project. Watts Construction intends to break ground for the new 90-unit hotel in three weeks with an estimated completion time of 10 months. Glad they have demolished the former Knights Inn……it was really looking sleeeeezy lately. New Comfort Suites will be a nice…..clean….modern replacement. You really need a job. Maybe you can go down there and swing a sledge hammer or something. I bet they are hiring.